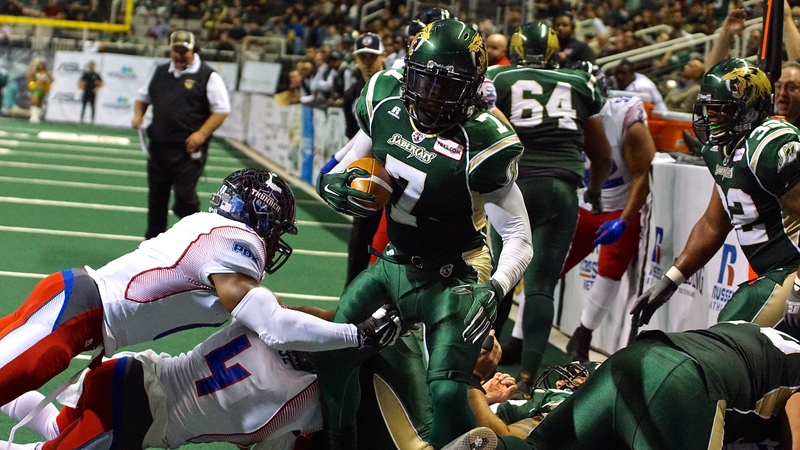 SAN JOSE, CALIF. – The National Conference leading San Jose SaberCats (12-1) will play on the road for the second straight week to take on the Spokane Shock (4-8) on Friday, June 26, with kickoff set for 7:00 p.m. PDT. The Pacific Division rivals have squared off twice this season, with San Jose outscoring Spokane by a combined score of 138-54. The third time around will feature quarterback Erik Meyer’s first game at Spokane Veteran’s Memorial Arena as a SaberCat. Meyer, who spent the first five seasons of his career with the Shock, winning the 2013 Arena Football League Most Valuable Player award, has thrown for 61 touchdowns and ranks in the top-five of nearly every passing category this season. While San Jose possesses a former league MVP, the starting receivers have been the catalyst for the offense. 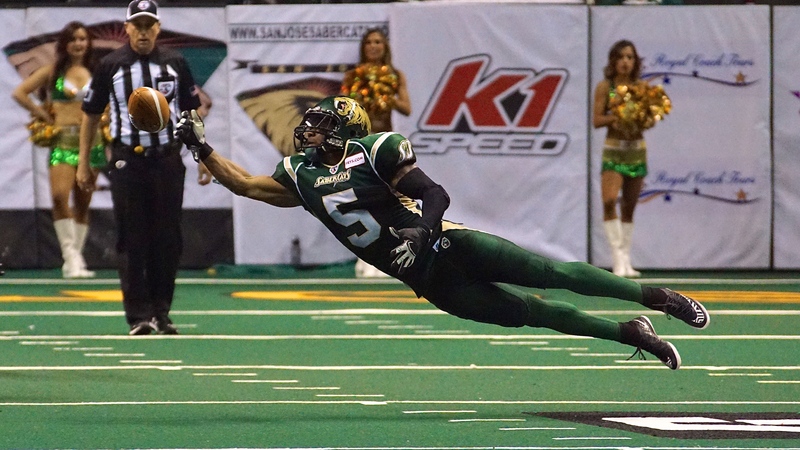 Setting the pace is Reggie Gray, whose 110 receptions, 1,195 receiving yards and 29 touchdowns leads the SaberCats and is also among the top-five in the league. Additionally, Adron Tennell has been critical to the success of the offensive attack. 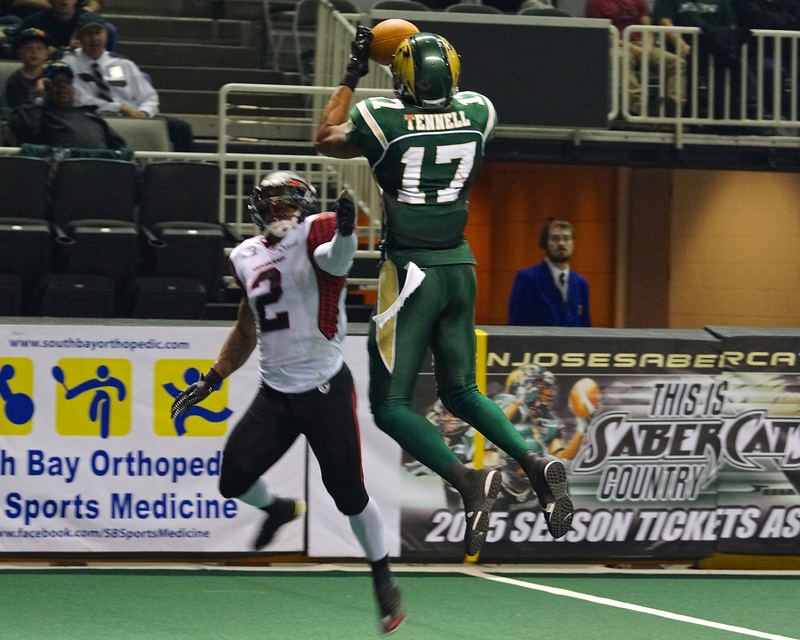 Tennell, who won the 2013 AFL Receiver of the Year as a member of the Shock, is second on the team with 18 touchdowns and has added 586 receiving yards, providing the ability to move the chains as well as be a threat in the red zone. A versatile playmaker, Darius Reynolds has excelled as a receiver, on special teams and occasionally, filling in defensively. Reynolds has totaled 13 touchdowns, hauling in nine touchdown receptions adding four on the ground, while notching 12 tackles this season. Averaging 59.4 points per game, the SaberCats’ potent offense remains the best in the league. Offensively, Spokane has turned to Carson Coffman as the starter under center. Coffman led the Shock to a 69-54 victory over the Portland Thunder, completing 20-of-32 passes for 328 yards and a season-high nine touchdowns. Last month, Spokane added receiver Jabin Sambrano to go along with Anthony Amos and Nick Truesdell. Sambrano, who has spent the past three seasons in the National Football League, most recently with the Atlanta Falcons, led the Shock last week with eight receptions and 125 yards, adding two touchdowns. Similarly, Truesdell is coming off his best performance of the season last week against the Thunder. Entering the matchup, Truesdell (6’7” 240) had 12 touchdowns through nine games, but in a breakout performance, he added five touchdowns on seven receptions and 124 yards. Meanwhile, Amos currently leads the team among active players with 70 receptions for 758 yards. Defensively, the SaberCats are led statistically, by Ken Fontenette, Jason Stewart and Francis Maka. Fontenette has had a nose for seeking out the football, leading the league with 98.5 tackles and is second in the league with 10 interceptions. Meanwhile, Maka ranks third in the AFL with 8 sacks, two safeties and has added 17 tackles his season. 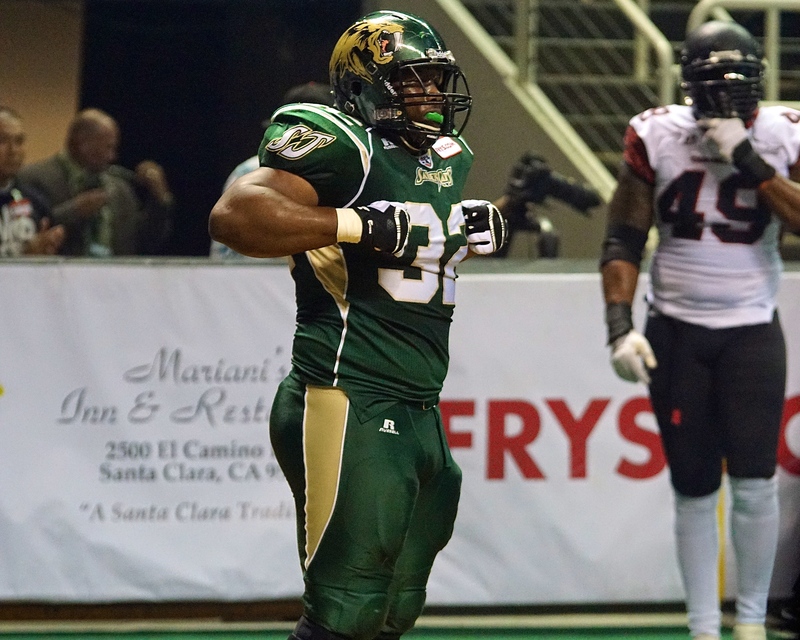 The 2014 Defensive Player of the Year, Jason Stewart has been a menace in the middle of the SaberCats’ pass rush. Stewart is right behind Maka with 7.5 sacks and has 17.5 tackles with eight going for a loss. The crushing San Jose defense has allowed just 37.2 points per game, to lead the AFL, though they will be tested against a Shock offense that is coming off a 69 point outing last week. San Jose’s defense has a league-high 24 interceptions and has only surrendered 48 passing touchdowns, the fewest in the Arena Football League by a margin of 11. The Pacific Division matchup can be seen live on ESPN3, the Watch ESPN app or on radio 1220AM KDOW. LAS VEGAS, NEV. – The San Jose SaberCats (12-1) scored 35 unanswered points in the second half to pull away from the Las Vegas Outlaws (4-8), securing a 63-31 road victory on Father’s Day. The Outlaw’s got out to an early lead, scoring on a three-yard touchdown pass from J.J. Raterink to Will Wright. 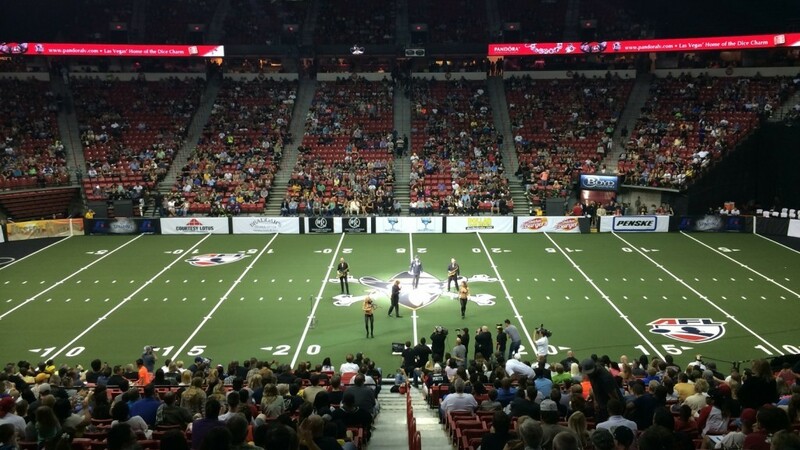 After the SaberCats evened the score at 7-7 on an Erik Meyer 10-yard touchdown pass to Adron Tennell, Gerald Young returned the ensuing kickoff for a touchdown, as Las Vegas found itself up 14-7 in the first quarter. As they have done the entire season, the resilient SaberCats’ defense forced the necessary stops to provide the offense with opportunities. San Jose took its first lead of the game at 21-14, with a 15- yard touchdown pass from Erik Meyer to Darius Reynolds in the second quarter. The Outlaws added a 35- yard field goal at the end of the first half, cutting the SaberCats’ lead, 21-17. Meyer completed 20-of- 28 passes for 216 yards and two touchdowns, adding another on the ground. Receiving the opening kickoff of the second half, San Jose relied on Tennell and Reggie Gray to matriculate down the field, setting up Meyer for the one-yard quarterback sneak, finding pay dirt as the lead swelled to 28-17. 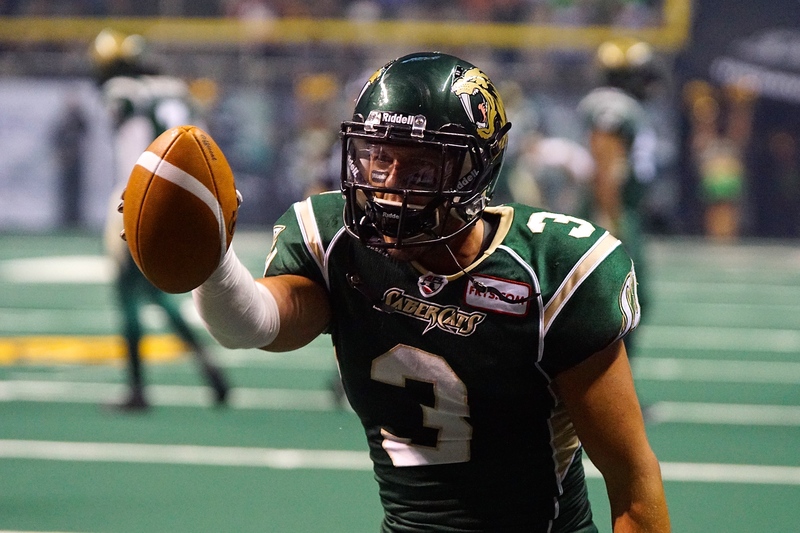 Gray, the leading receiver for the SaberCats this season, hauled in a team- high eight receptions for 67 yards; while Tennell added five receptions for 66 yards and a touchdown. Making his second appearance of the season, rookie defensive back Fred Obi intercepted a Raterink pass in the third quarter, returning it down to the two yard line. The turnover set up Reynolds for a two-yard rush, spinning off the pile and running in the touchdown, extending the SaberCats lead to 35-17. Darius Reynolds finished with four receptions for 56 yards and three total touchdowns (two rushing). One of the premier pass rushers in the league and a San Jose native, Francis Maka found himself unabated to Raterink on several instances, finishing with two sacks. The ability to get pressure on the quarterback, while the secondary tightens its coverage is referred to by the SaberCats team as “pressure picks, coverage sacks”. This combination of effective defense has kept San Jose among the leader in the Arena Football League in defensive scoring. Jumping the receiver’s route, Obi grabbed his second interception of the game, returning this one for a 20-yard touchdown to give San Jose a commanding 56-17 lead at the 9:02 mark in the fourth quarter. Obi finished with a team-high eight total tackles and had the first two interceptions of his AFL career. Entering the game in relief of Raterink, who threw three interceptions, Dennis Havrilla rushed for 30 yards on his first possession, capping off the fourth quarter drive with a seven yard touchdown run, cutting into the SaberCats 56-24 lead. Additionally, Young also led the team in receiving with six receptions for 95 yards and added a one yard touchdown run in the final minute. 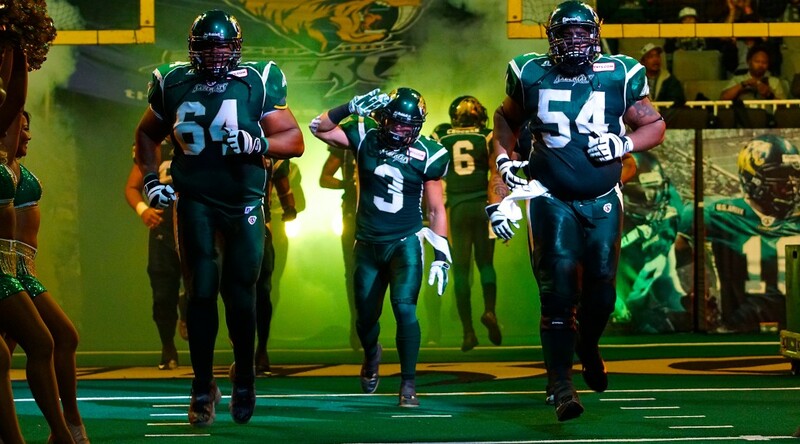 The SaberCats have a quick turnaround, as they will travel to take on Pacific Division rival the Spokane Shock Friday, June 26th with a 7:00 p.m. PDT kickoff. The game can be seen live on ESPN3 or the Watch ESPN app or can be heard on the radio on 1220AM KDOW. Portland, OR. – The San Jose SaberCats (10-0, 3-0) held off the Portland Thunder (3-6, 1-2) 61-42, on Saturday afternoon at the Moda Center. In the second of three meetings this season for the Pacific Division rivals, the SaberCats got off to a slow start, but took over the reins with a momentum shifting second quarter, propelling them to victory and remaining unbeaten. It did not start well for San Jose, after they fumbled the opening kickoff, allowing a safety; Portland drove down the field and scored on a Jared Perry touchdown reception, jumping out to an early 9-0 lead. The SaberCats responded though, getting on the board with an Odie Armstrong bruising 4-yard touchdown run, to cut the Thunder lead to 9-6. Armstrong added another touchdown in the final minute, the 96th of his career, passing Bo Kelly for third most in AFL history. On the ensuing kickoff, David Hyland stripped Duane Brooks and defensive back Clevan Thomas dove on the ball for the recovery. Thomas also had an interception in the first half and San Jose capitalized on the turnover with a 5-yard touchdown pass from Erik Meyer to Reggie Gray, taking a 13-9 lead. Erik Meyer, last week’s AFL Offensive Player of the Week, had another stellar performance, completing 31-of-40 passes for 264 yards and seven touchdowns. Following a Kyle Rowley 1-yard touchdown run for the Thunder, the SaberCats scored 20 unanswered points on Adron Tennell and Reggie Gray touchdown receptions, leading 33-15 at halftime. Earning AFL Most Valuable Player of Week 9, Gray had 15 receptions for 137 yards and five touchdowns, matching his mark of five touchdowns from last week’s game against the Cleveland Gladiators. Trailing 40-15 in the third quarter, Portland scored on a kickoff return for a touchdown by Duane Brooks, who made several SaberCats miss en route to the end zone. Brooks added another kick return for a touchdown late in the fourth quarter, bringing his total to four on the season. Leading all defenders with nine tackles on the night, Ken Fontenette added two second half interceptions in the end zone, now with nine on the season to lead the AFL. Acquired from the Jacksonville Sharks earlier this week, Portland quarterback Alex Carter took over for Rowley following the interception in the third quarter and connected with Perry on a deep, 39-yard touchdown, cutting the San Jose lead to 40-29. Rowley struggled to find consistency, completing 9-of-21 passes for 75 yards before Carter took over. After completing his first two passes in a Thunder uniform, Carter finished strong, completing 5-of-8 passes for 89 yards and two touchdowns. The Thunder receiving duo of Jared Perry and V’Keon Lacey continues to be a bright spot this season. Lacey led the Thunder with five receptions for 59 yards and his one touchdown brought his season total to 14. Meanwhile, Perry hauled in four receptions for 58 yards and two touchdowns, including a 39-yard touchdown from Carter. For San Jose, receiver Adron Tennell had his third straight multi-touchdown game. The 2013 AFL Receiver of the Year hauled in eight receptions for 57 yards and added two touchdowns. 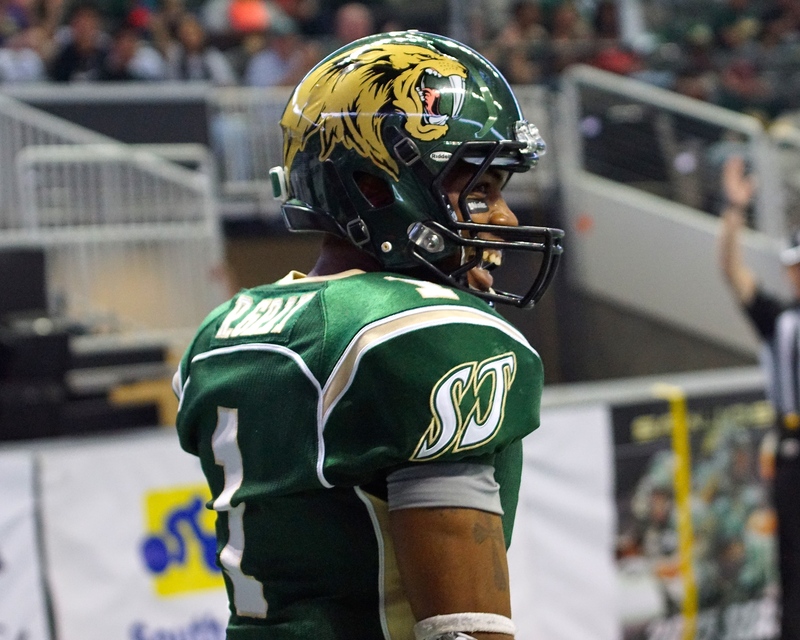 Making his first appearance of the season, SaberCats’ receiver Jeremy Kelley added eight receptions for 70 yards. 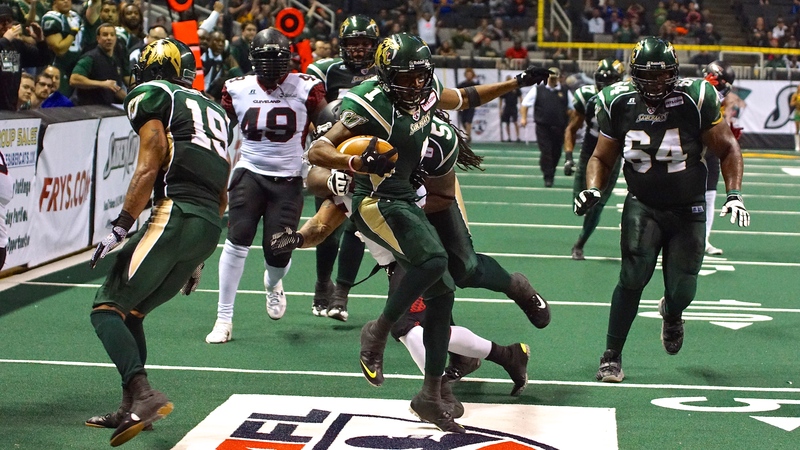 The SaberCats defense came into the game leading the AFL, surrendering only 37.4 points per game and with two special teams’ touchdowns for the Thunder; the defense held the Thunder offense to only 28 points scored, continuing to dominate. San Jose will be at home at the SAP Center on Friday, June 5th to take on its other Pacific Division foe, the Spokane Shock; kickoff is at 7:30PM PDT. 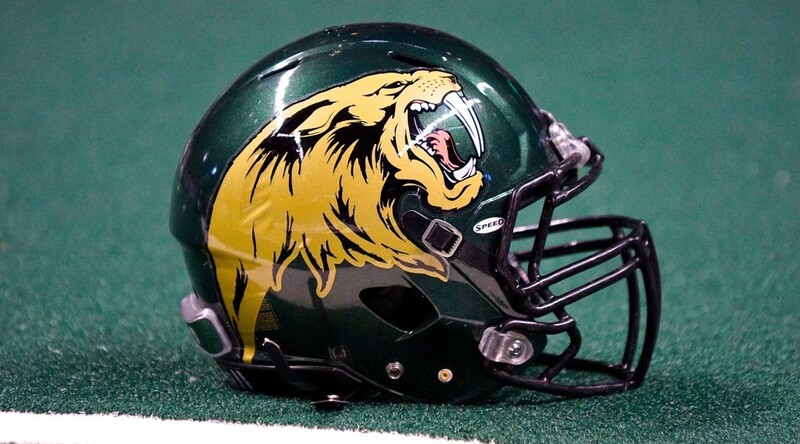 San Jose, Calif.- The San Jose SaberCats (9-0, 2-0) will travel to take on the Portland Thunder (3-5, 1-1) at the Moda Center on Saturday, May 30th. In a rematch from week five, where the SaberCats defeated the Thunder 64-45 at home, the Pacific Division rivals will meet for the second of three regular season games. 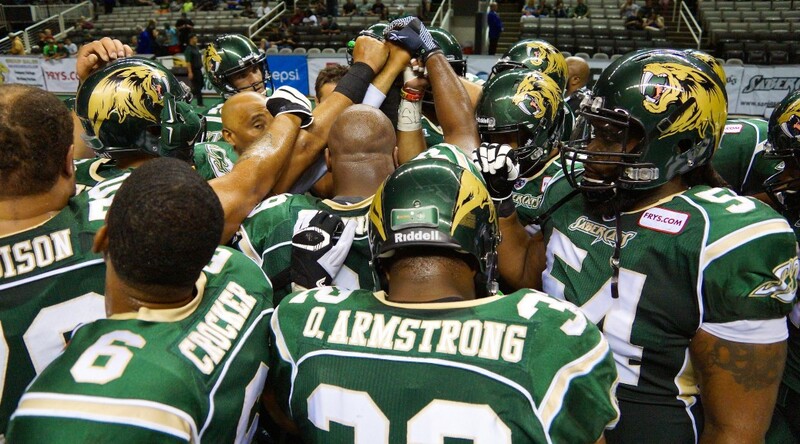 The SaberCats are reeling, after a 70-58 comeback victory over the Cleveland Gladiators last week, to remain unbeaten. On the contrary, Portland has lost three of its last four games, including a 69-43 defeat at the hands of the Orlando Predators last week, after starting the season 2-1. 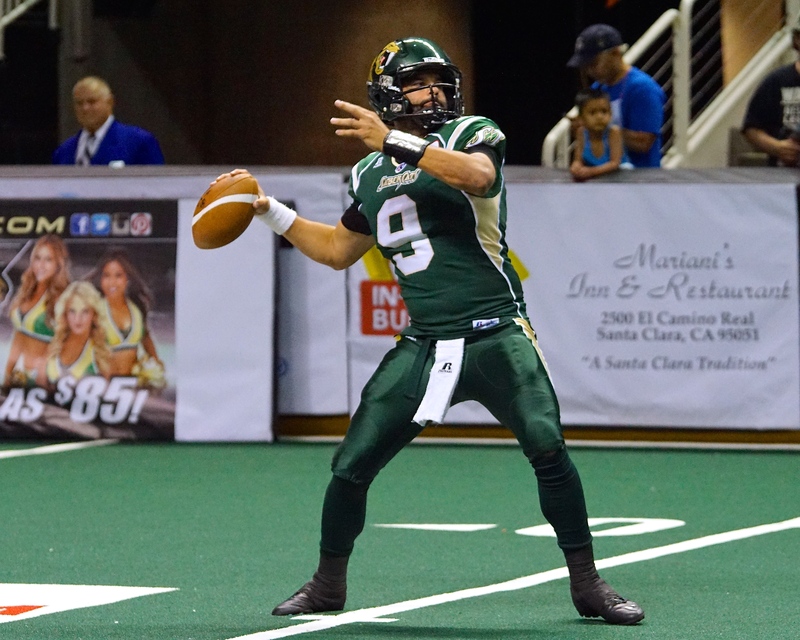 After missing two games, SaberCats’ quarterback Erik Meyer returned to the starting lineup and put on a gem against the Gladiators. Meyer completed 71.4-percent of his passes for 406 yards and set a season-high with nine touchdowns, leading San Jose to a second half comeback win. Meyer has been stellar in his first season with San Jose and despite missing two games; he is still ranked in the top five statistically among quarterbacks in the league. 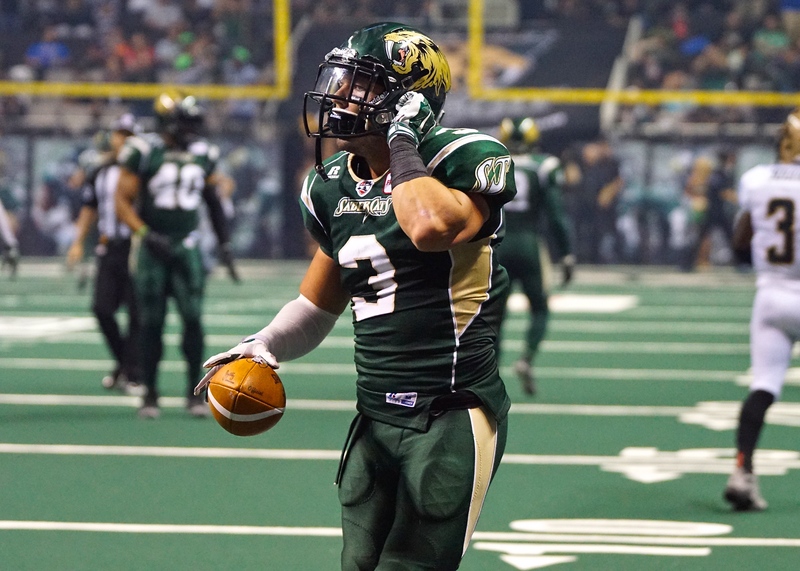 Meyer has been aided by some of the best receivers, who have propelled the SaberCats to the top of the league in scoring (61.2 points per game). Reggie Gray, the team’s leading receiver is coming off of a season-high performance in the win last week, over the Gladiators. “Big Play” had 14 receptions for 201 yards and five touchdowns to lead all receivers in the game. This season Gray has 767 receiving yards and 19 touchdowns, while also making a tremendous impact on special teams with three kick returns for a touchdown. Meanwhile, Adron Tennell has also been a focal point for the offense. With his already established rapport with Meyer from their years as teammates with the Spokane Shock, Tennell has 15 touchdowns in eight games, including five in the past two weeks. Portland’s defense is led by the young defensive back duo of Okechu Okoroha and Osagie Odiase is ranked first and second on the team in total tackles. Odiase, a rookie out of Sacramento State, has 39.0 tackles as well as 10 pass breakups and two fumble recoveries. Alongside him, Okoroha has also recovered two fumbles and has 29.0 total tackles. The secondary of Portland will have its hands full with the full array of talent San Jose has at receiver. Ranking first in the league in almost every defensive category, the SaberCats stout defense is led by defensive back Ken Fontenette. 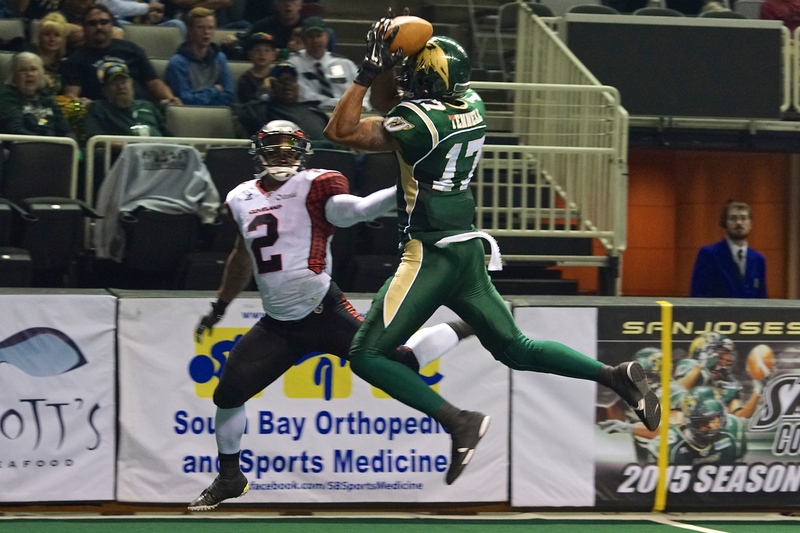 Fontenette leads the AFL with seven interceptions, including three against the Spokane Sock in week eight. He is also tied with teammate David Hyland with 63.5 total tackles to lead the league. As a unit, the four man rotation of the San Jose defensive line, along with linebacker Francis Maka, has totaled 25 sacks to lead the AFL. Luis Vasquez, Jason Stewart, Donte Paige-Moss and Rodney Fritz all have four or more sacks, while Maka is second in the AFL with six. The defensive unit for the SaberCats has been a menace for opposing offensive lines and their ability to get pressure on the quarterback has allowed the secondary to capitalize on turnovers. Working as a cohesive unit, the SaberCats defense will look to remain the best in the league under the guidance of defensive coordinator Cedric Walker. Portland’s leading receiver V’Keon Lacey has had six touchdowns over the past two weeks and 13 total on the season. With Jamar Howard out, Jared Perry and Duane Brooks have stepped up in the other receiving roles for the Thunder. Perry, the 2011 AFL Rookie of the Year, has totaled 322 yards and seven touchdowns in four games this season. Meanwhile, Brooks is coming off a his best performance of the season last week against the Orlando Predators, where he led the Thunder with 12 receptions for 101 yards and two touchdowns. Similar to the matchup against the Cleveland Gladiators last week, the SaberCats will have a trio of receivers to keep tabs on in the secondary. Portland quarterback Kyle Rowley has had some high and low spots this season; while Darron Thomas, the former Oregon Duck, has started the past couple of weeks. Thomas went out with an injury in last week’s game against Orlando and it is still uncertain who will start under center for Portland. Regardless of who is taking the snaps, they will be tasked with facing the league’s top ranked defensive unit. This Pacific Division game will also feature two of the top head coaches as well. SaberCats Head Coach Darren Arbet is ranked second all-time in regular season wins (161), while Thunder Head Coach Mike Hohensee ranks third (156). The SaberCats are 4-0 all-time in games against the Thunder and with a win Saturday; they could pull ahead by 6.5 games in the Pacific Division. The game can be found on ESPN3 or by radio on 1220AM KDOW with David Lewis and Ben Nelson on the call. 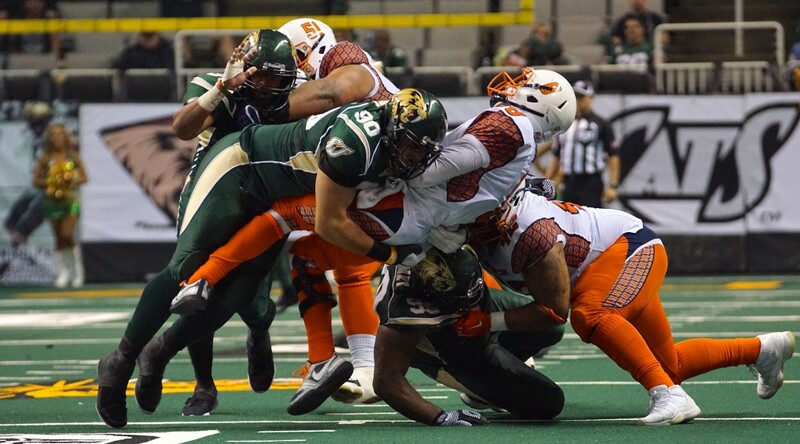 Spokane, Wash. – The San Jose SaberCats (8-0, 2-0) defeated the Spokane Shock (2-5, 0-2), 83-28 at Spokane Veteran’s Memorial Arena on Saturday May 16th, to remain undefeated on the season. Getting his second consecutive start for San Jose, quarterback Nathan Stanley built on his success from last week’s performance against the Las Vegas Outlaws; completing 14-of -22 passes for 212 yards and set a career-high with eight touchdowns (nine total), leading San Jose’s offense to its highest point total of the season. San Jose’s 83 points was the highest point total this season scored by an Arena Football League team and the first to eclipse 80 points in a game. The SaberCats got on the board first, with a 14-yard touchdown pass from Stanley to Darius Reynolds. On the ensuing drive, defensive back Ken Fontenette grabbed an interception from Spokane quarterback Warren Smith. Fontenette finished with six tackles, a fumble recovery on special teams and now leads the Arena Football League with six interceptions this season, after adding three against Spokane. Rich Ranglin made it 14-0 in the first quarter, after hauling in a 17-yard touchdown, his third of the season. Spokane cut the San Jose lead to 14-7, with a 7–yard touchdown from Smith to receiver Anthony Amos. Amos finished with a team high nine receptions for 87 yards and two touchdowns. The SaberCats answered in the beginning of the second quarter, with a 3-yard touchdown from Reynolds to make it a 21-7 lead. Reynolds added a 37-yard touchdown reception off a screen play and finished with a team-high 85 yards on four receptions and four total touchdowns (three receiving). The Shock’s leading receiver this season, Mike Washington added to his touchdown total, with a leaping 6-yard touchdown reception, crashing into the end zone boards to cut the SaberCats’ lead to 21-14, prior to the end of the first quarter. Washington finished with eight receptions for 74 yards and a pair of touchdowns and the 21-14 mark was the closest Spokane got within of San Jose. With a big hit from David Hyland on Shock receiver Rashaad Carter, Ken Fontenette grabbed the deflection and returned the interception for a touchdown to extend the SaberCats lead to 42-21 in the second quarter. The SaberCats held a commanding, 49-21 lead at halftime, after Stanley scrambled right and ran in a 3-yard touchdown with under a minute left tin the half. Whether it was through the air, or on the ground, Stanley had a career night. After spending four seasons with the Shock, SaberCats’ receiver Adron Tennell returned to Spokane and had a tremendous impact. Tennell finished with six receptions for 74 yards and hauled in three touchdowns. Also starting his second straight game, Spokane quarterback Warren Smith did not have the same success he had last week against the Los Angeles KISS. Smith threw for 206 yards and four touchdowns, but was picked off four times. After trailing 76-28 with seven minutes remaining, the Shock turned to Chase Coffman at quarterback. Coffman was unable to rally Spokane against the dominant SaberCats’ defense, completing only 1-of-8 passes for five yards to end the game. The SaberCats outscored the Shock 34-7 in the second half to sustain their lead and secure the win. After the Philadelphia Soul lost to the Jacksonville Sharks, San Jose is the only unbeaten team in the AFL and will be back at home next week Saturday, May 23rd at 7:30PM PDT, to host the Cleveland Gladiators (5-3) for Military Appreciation Night at the SAP Center. 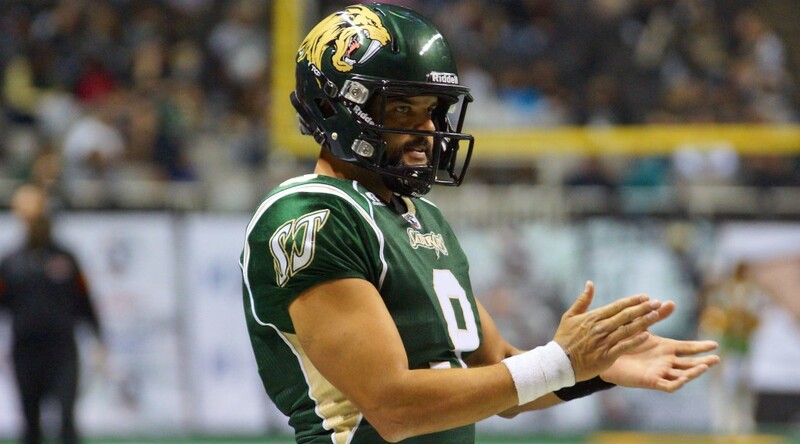 Jacksonville, Florida – The San Jose SaberCats (4-0) remained undefeated after taking down the Jacksonville Sharks (0-4) 68-48, Friday at Veteran’s Memorial Stadium in Jacksonville, Florida. AFL All-Time leading rusher, fullback Derrick Ross bulldozed his way into the end zone on the first drive to give the Sharks an early 7-0 lead. Ross, who was acquired for the Philadelphia Soul this off-season, continued to be focal point for the offense. He finished with 11 rushes for 35 yards and a season-high four touchdowns. Ross continues to be the go-to player within the five yard line of the red zone for Jacksonville. On the night, he also eclipsed a milestone with his 150th rushing touchdown for his AFL career. Continuing his impact play, jack linebacker David Hyland snuffed out a pass play and picked off the Tommy Grady pass at the Jacksonville seven yard line, his second interception of the season. Hyland continues to excess at the jack linebacker spot for San Jose and led the team in tackles with 14. Reggie Gray was able to extend the San Jose lead to 14-7, after hauling in a five yard touchdown reception. As the SaberCats leading receiver this season, “Big Play” Reggie Gray finished with nine receptions for 80 yards and three touchdowns. As the Arena Football League’s leading receiver, Anthony “Tiger” Jones demonstrated his abilities early an often. Jones finished with seven receptions for 100 yards, but was unable to add to his league-high 10 receiving touchdowns. 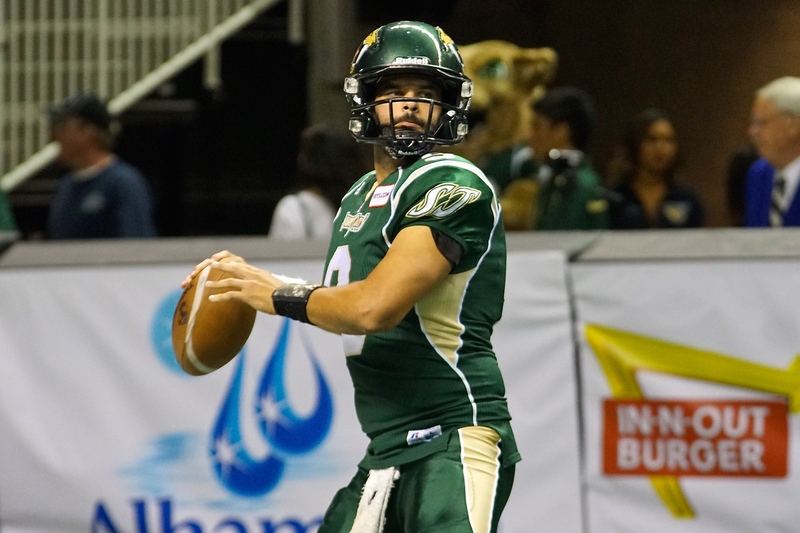 SaberCats quarterback Erik Meyer threw for a season –high eight touchdowns, completing 19-of-30 completions for 246 yards. Odie Armstrong, an avid Madden video gamer, pressed the B-button on the Xbox (O on the PlayStation) and spun into the end zone for a four-yard touchdown run, to give San Jose a 21-7 lead in the second quarter. Armstrong added to his rushing touchdown total with five on the season. 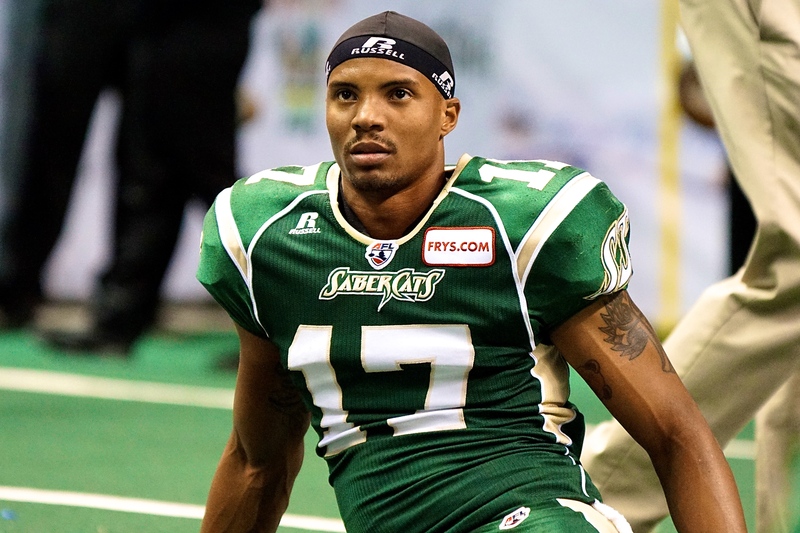 With his return to the starting lineup, SaberCats’ receiver Adron Tennell, the 2013 AFL Wide Receiver of the Year, made an immediate impact. He finished with five receptions for 65 yards and four of those going for touchdowns. In the Second quarter, Sharks’ receiver Joe Hills hauled in multiple receptions, matriculating the offense down to the goaline, with Ross able to do what he does best and rumble in for a one-yard touchdown run to cut the SaberCats lead to 21-14. Hills led the Sharks with 14 receptions for 155 yards and a touchdown. After a great performance in his first game as a SaberCat last week, receiver D.J. Stephens continued to shine for San Jose. Stephens caught a 33-yard pass from Meyer and was brought down just a yard shy of the end zone. Unfortunately, defensive end Joe Skyes, a member of the SaberCats last season, jumped in on a botched snap and forced a fumble that was eventually recovered by Jacksonville. Following the fumble recovery, Jones sacrificed life and limb to haul in a 30-yard reception while flying over the boards to set up a Ross touchdown run. With a Darius Reynolds reception bringing the SaberCats down to the four yard line, Meyer found Gray in the end zone on fourth down, as San Jose led 28-24 at halftime. Following a Joe Hills touchdown reception by the Sharks, Gray was able to grab the kickoff and returned it 58-yards for a touchdown, the first on the season for San Jose, who responded immediately and pushed out to a 48-38 fourth quarter lead. It did not take long for Jacksonville to answer, as receiver Jerod Harvery grabbed an 18-yard touchdown, his first touchdown reception of the season to make it a 48-45 San Jose lead. With eight minutes remaining in the fourth quarter, Meyer found Stephens in the back of the end zone. In his second game with San Jose, Stephens finished with three receptions for 84 yards and a touchdown. On the ensuing kickoff, SaberCats defensive end Donte Paige-Moss was able to recover the ball off of the uprights to provide the San Jose offense with the ball at the eight yard line. The recovery was culminated by a Gray touchdown reception to give the SaberCats a 62-45 with 3:46 remaining. A late interception by defensive back Erik Crocker sealed the win for San Jose, who will be back at home in the SAP Center to host the Portland Thunder on Saturday April, 25th. The ArenaBowl XVI, XVIII and XXI champion San Jose SaberCats finished their 19th season in the AFL with a Pacific Division Title after making their return in 2011. Fans and sponsors can go to sanjosesabercats.com or call 408-673-3400 to sign up to receive the latest news and updates about the SaberCats, as well as to purchase 2015 season tickets. Make sure to follow the SaberCats on Facebook and Twitter for all the latest news on the team. Las Vegas, Nevada – The San Jose SaberCats (1-0) rode a colossal first half to defeat the Las Vegas Outlaws (0-1) 59-41 at the Thomas & Mack Center Monday night. Taking the ball under center, SaberCats’ quarterback Erik Meyer looked across the middle of the field and found the always reliable Ben Nelson for a 14-yard first down, his first completed pass as a SaberCat. The SaberCats shook off the season opener jitters en route to a 21-0 first quarter lead. The SaberCats got on the board first, when Odie Armstrong took the handoff in for a two yard touchdown. Meyer followed that with 32-yard touchdown pass to Reggie Gray, after an offside penalty on Outlaws’ defensive end Terrance Carter allowed for a free play. On the Outlaw’s opening drive, SaberCats defensive backs Virgil Gray and Eric Crocker were both flagged for defensive holding in the secondary. The ball hawking Gray found his redemption though, picking off Outlaws’ quarterback J.J. Raterink in the end zone two plays later. On the ensuing two Outlaw possessions, Gray and the rest of the SaberCats’ defense forced a turnover-on-downs, including a goal-line run stop. On the contrary, Meyer led the San Jose offense on six straight first half scoring drives. The former Spokane Shock duo of Meyer and wide receiver Adron Tennell were officially reacquainted, as Tennell hauled in a one-handed reception, as he crashed over the boards for a 29-yard touchdown, giving the SaberCats a 21-0 first quarter lead. 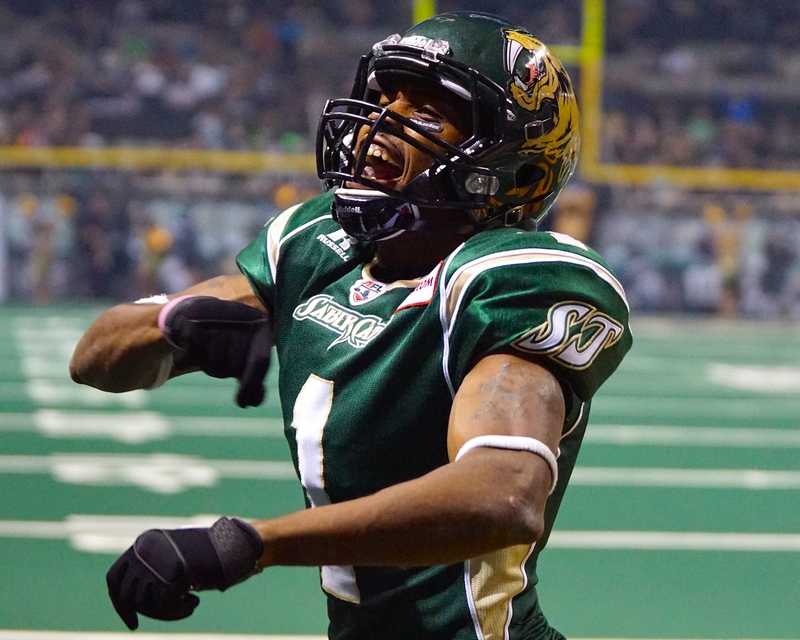 Tennell hauled in five receptions for 84 yards in his SaberCats debut. In his debut with San Jose, the 2013 AFL Most Valuable Player distributed the ball around, throwing for 294 yards on 18-of-29 passes and six touchdowns, while tossing at least one touchdown pass to each of his four receivers. Gray led all SaberCat receivers with seven receptions for 89 yards. The ageless wonder, SaberCats’ wide receiver Ben Nelson got into the fray as well, catching two first half touchdowns from Meyer, to bring his AFL career total to 172 touchdown receptions. Nelson totaled four receptions for 60 yards. 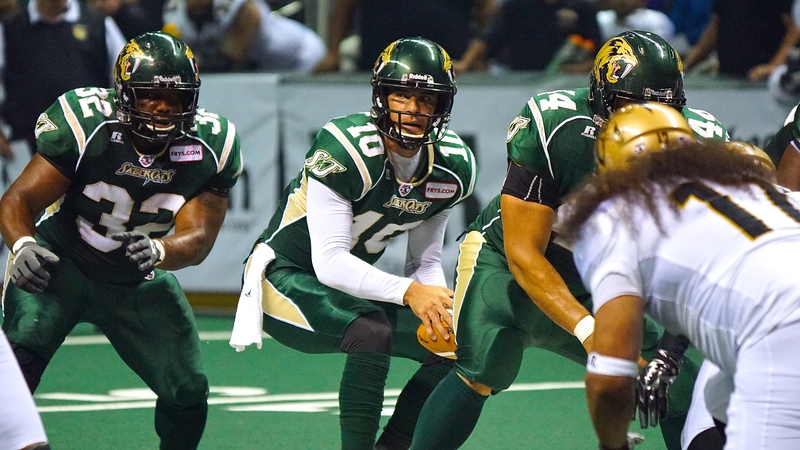 Scoring the first points for the Outlaws’ franchise, Raterink was able to run in two touchdowns to cut the SaberCats lead to 42-13 at halftime. The Outlaws’ maneuvered the ball into the redzone on five separate occasions in the first half, but only capitalized twice. On the opening drive of the second half, the Outlaws marched down the field and scored when Las Vegas native, Tysson Poots, caught a four yard touchdown reception from Raterink, his first of three touchdowns on the night. Poots finished with seven receptions and 123 yards to lead all receivers. After the SaberCats offense surrendered their first turnover on downs, the defense answered the call. After defensive end Luis Vasquez stripped Raterink, David Hyland scooped up the ball and was tripped up at the five yard line. The SaberCats would extend their lead to 49-20 after Meyer found Tennell for the second time in the end zone. There was a bit of a scare for the SaberCats after the pass, when Meyer was taken down by a host of Outlaw defenders and was seen icing his hand between possessions. Similar to the 2014 season, where he took over for starting quarterback Russ Michna, Nathan Stanley assumed the role from Meyer but was unable to find the same immediate success. Coming off of the edge, Terrance Carter sacked Stanley on fourth down to force a turnover. Taking over on downs, Raterink connected with rookie wide receiver LaDon Hudson on a seven yard touchdown pass, to bring the Outlaws to their closest mark at 49-34. After the SaberCats recovered an onside kick and scored on Armstrong’s second rushing touchdown, the Outlaw’s answered when Poots climbed the ladder, snagged a one-handed reception, broke a tackle and raced into the end zone. The score cut the SaberCats lead to 56-41 midway through the fourth quarter. 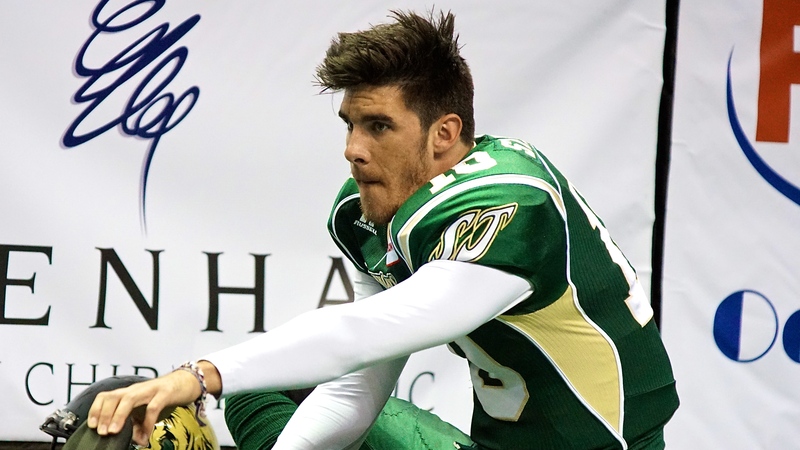 After Meyer returned to the lineup, the SaberCats extended their lead to 59-41 on the leg of 2014 AFL Kicker of the Year Nich Pertuit, who connected on a 25-yard field goal. Despite being outscored 17-28 in the second half, San Jose held on thanks in large part to the arm of Erik Meyer and their havoc creating, opportunistic defense. . The ArenaBowl XVI, XVIII and XXI champion San Jose SaberCats finished their 19th season in the AFL with a Pacific Division Title after making their return in 2011. Fans and sponsors can go to thesanjosesabercats.com or call 408-673-3400 to sign up to receive the latest news and updates about the SaberCats, as well as to purchase 2015 season tickets. Make sure to follow the SaberCats on Facebook and Twitter for all the latest news on the team.